He begins his poem "In Walked Bud" by humming Thelonious Monk's song of the same name. He opens "Dope" with chant-like the projections: "uuuuuuuuuuuu." At the end of "Somebody Blew Up America," he shouts as he enacts the sound of an owl: "Whooooooooooo!?! Whoooooooooo!?!" Back in the day on his album It's Nation Time (1971), he sings and projects all kinds of utterances that go beyond conventional speech and poetic patterns. 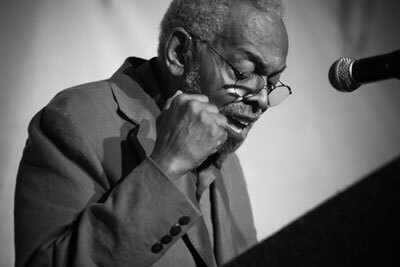 No prominent poet has contributed such a broad body of wordless phrasings to the discourse on poetry as Amiri Baraka. Few widely known literary figures have threatened the standards of poetry and performance for such a long period of time. Hardly any has induced fear and even been arrested and sentenced based on poems. Baraka's willingness to continually step out on a limb and risk being viewed as strange based on his articulation of so many non-word expressions have contributed to his reputation as such an extraordinary performer. Since poetry is largely known for writers' use of words, Baraka creates multiple surprising moments by going off script and redefining what verse can be. Baraka embeds the hummed melody of Monk's "Misterioso" in his poem "Bang Bang Outishly," even interrupting himself throughout the reading to ensure that the song gets its turn, and thus creates new opportunities for performing and experiencing both the jazz tune and the poem. At times, Baraka's projections resemble the black arts of spell casting and spirit invocation. He regularly hums tunes of his favorite jazz musicians at the beginnings and sometimes throughout poems as a way of calling forth the presence of those beloved artists. His moans and shouts, perhaps most notably in his poem "Dope," correspond to the happenings of black church expressivity. Overall, his performances are an extravaganza of sonic possibility. The fearlessness of Baraka's style of delivery becomes most apparent when you attempt to re-present his work for a live audience. You begin to realize that in order to present the pieces as Baraka presents them requires you to forgo your feelings of embarrassment and muster up some courage. It's only when you're attempting his strange and wild utterances in front of a crowded room of people that you appreciate the scary nature of Baraka's wordless phrasings.